Like every human being, I have been evolving through projects all my life. At 31, managing projects became my profession. Some of my first projects were failures, but important learning experiences. 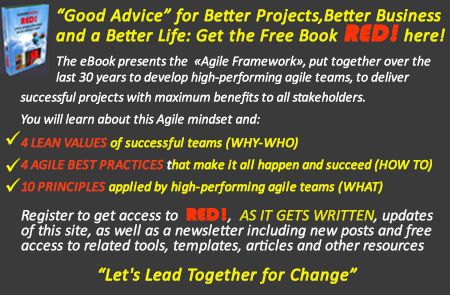 I changed, developed and eventually delivered more successful projects, as I embraced new best practices (how to do) and new best behaviors (how to be). Most importantly, over more than 30 years as a professional project manager, consultant, coach, mentor and trainer, my own beliefs (why to do and to be) have evolved significantly into a mindset that fosters better, more successful projects. My beliefs are the basis of all the training, coaching, consulting and speaking I do. Integrating similar beliefs and living by them are why my clients, my students and I have been successful delivering win-win projects, with maximum value and more benefits for everyone. These beliefs are my raison d’être. I am also convinced that I share them with every person, project leader or not, who has the same business and overall life purpose as I: contribute to build a happier and more sustainable world for all of us. I believe that every human being is a miracle of life and has unlimited value. I believe that we are all equals. I believe that every person tries his or her best and has a positive intention. I believe we were born to be happy and that the projects we do together can and must make us happier. I believe that everyone manages projects from birth and, intuitively, knows how. I believe that no one is truly alone, and that others care about each of us. I believe that together we are stronger than alone. I believe that we have the capacity, both as individuals and collectively, to make a success of any project we choose. I believe that we are all co-leaders, co-sponsors and co-creators of the projects we do together. I believe that through our projects, we can change the world to be a better place for all. I believe in YOU, I believe in ME, I believe in WE. Any link between my beliefs, successful projects and all those balloons around me in the picture with this post? You bet! 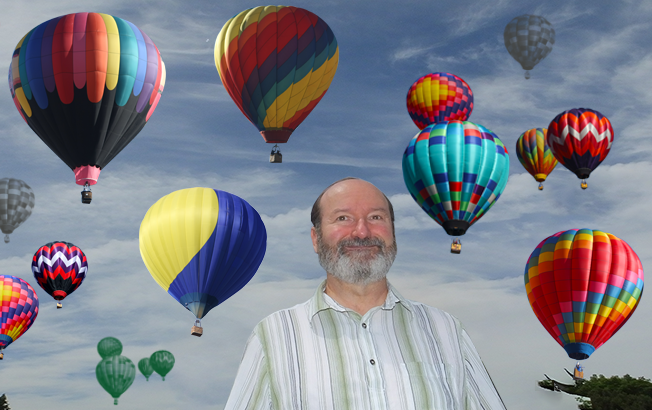 Those balloons symbolize for me the desired outcome of successful collaborative project management on our lives. They are powerful metaphor of a happy, peaceful, yet adventurous journey into life, created through meaningful collective projects. A sense of individual freedom. A feeling of infinite space and beauty. The sensation of escaping gravity and experiencing lightness and peacefulness. A larger, more complete view of the world we live in. An understanding of individual uniqueness and togetherness at the same time. The knowledge that we are not alone on this journey. The certainty that it is possible to be happy together, while preserving and celebrating our individuality. I am convinced this is exactly how a happy, sustainable, purposeful life should feel. This is how investing time and effort in projects should feel. This is why we are here. My beliefs have naturally evolved in response to the challenges of our times, the Project Age: an age of high complexity, turbulent continuous change and increasing scarcity of vital resources. Many have similar beliefs and aspirations for a more meaningful life and a sustainable future through collaborative projects. The whole of the Agile movement shares such a mindset. The majority of Millennials, the generation now rapidly taking the lead and shaping the future of humankind, shares similar beliefs and aspirations. My blog at ClaudeEmond.com will contribute useful knowledge and share time tested principles, tools and techniques to help each of you be more agile and successful in your business, at work, and in your life as whole. It will be dedicated to using an Agile mindset and fostering collaborative, co-creative realization of business projects, personal projects and other collective endeavors. We will discuss and learn here how to integrate and use agile-minded beliefs, practices and behaviors to ensure the success of your projects and delivering sustainable benefits for all. Your individual contributions in comments. Your content on a relevant subject, as a guest blogger. The richness of the collective intelligence that comes from co-creating posts on many subjects we care about. This blog can be a co-creative space, an agile, collaborative, learning project. We can blog together and we can lead together for a change. What about your own beliefs about successful and fulfilling collective endeavors or projects? At work? At home? In team sports? Elsewhere? What about flying balloons? Are they a good symbol for a fulfilling project, journey or life? What other metaphors or symbols could we used? All your comments are welcome here, as well as suggestions for specific subjects for future posts, written by ME, by YOU and by WE.